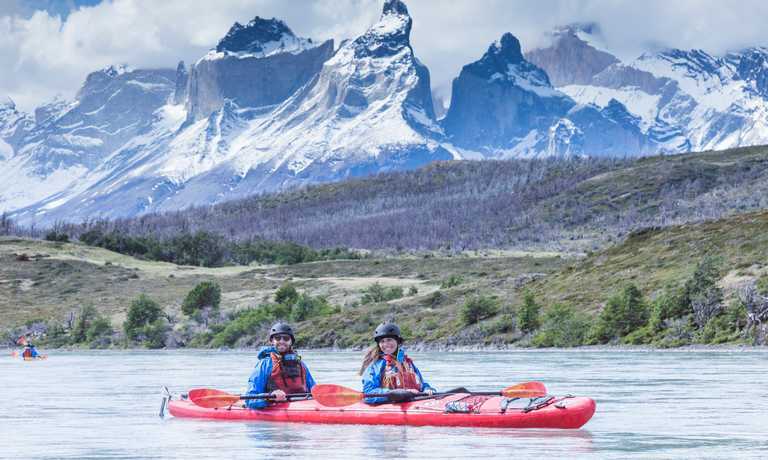 A 4 day kayak and camping trip along the Serrano river (starting from Torres del Paine and heading South). 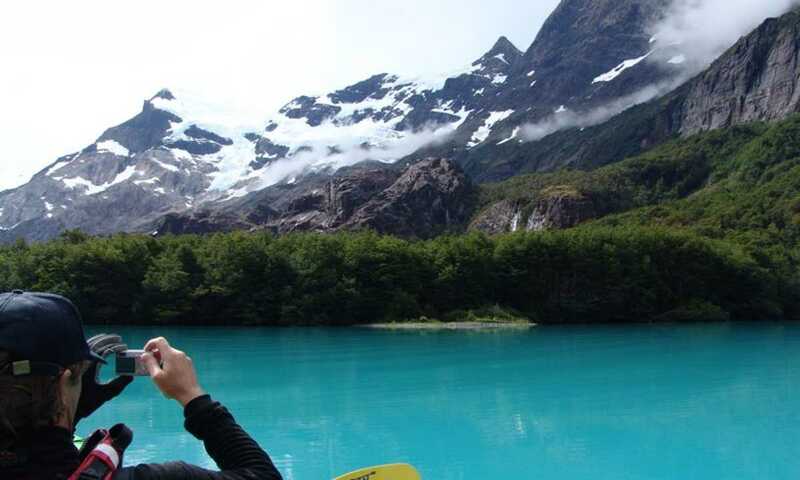 You'll kayak past waterfalls and glaciers and into beautiful blue lakes, all with an operator that focuses exclusively on this Serrano river area. 10:30: On the bank of the Serrano River we will initiate the instruction to ensure a safe and comfortable trip. 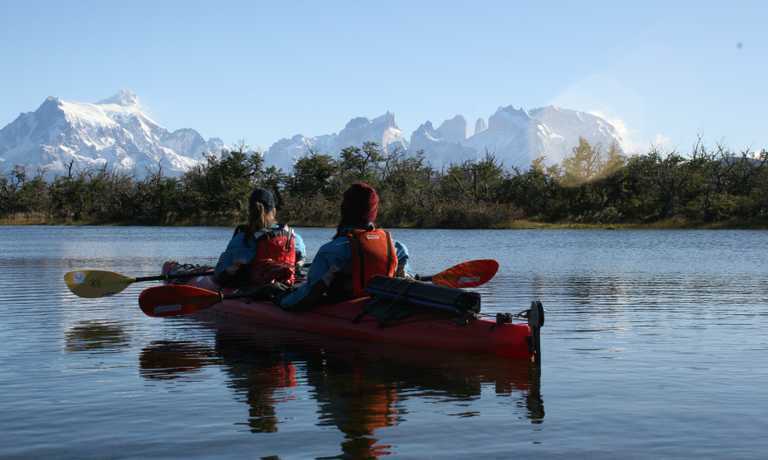 We will load the kayaks with the necessary equipment and with your luggage. If you have too much (more than a big bag per person) we'll take it to Puerto Natales where it will remain safe in our offices until your arrival. 12:00: The adventure begins. We will paddle to the Serrano fall (a beautiful cascade), where a short walk (200 metres approximately) and portaging the kayaks will allow us to avoid the waterfall. 15:00: We will leave the Serrano River and start paddling upstream along the Tyndall River. Sometimes we will have to drag our kayaks on the water because of the current and the scarce depth of the river. 16:30: A beautiful lake will be the first reward for having paddled up the Tyndall. 18:30: If the wind permits, we will be able to paddle across the lake to a comfortable sand beach, your tiredness will be forgotten when this place fills you with satisfaction. 19:30: A delicious dinner with a magnificent view, the virgin and unaltered Patagonia. 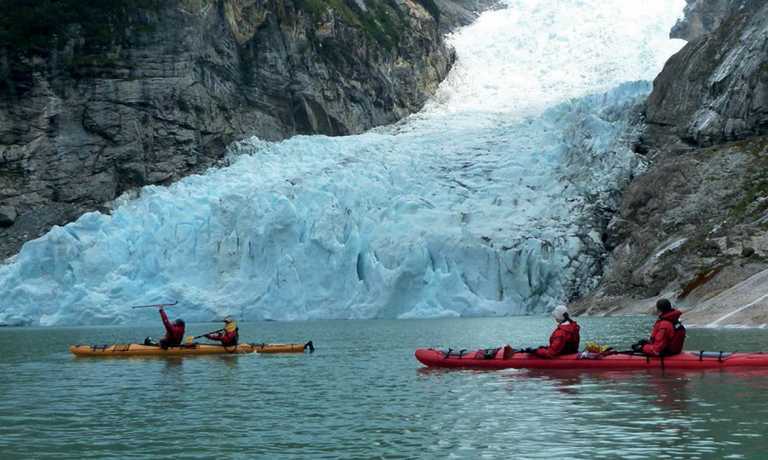 08:00: A complete breakfast will give us the energy to paddle to the Tyndall glacier. 11:30: We will arrive at the wall of a glacier more than 12000 years old. 12:00: We start paddling back to the Tyndall River. 14:30: We will paddle downstream along the Tyndall River. It will be the right moment to appreciate the beauty of the river, in case all that effort prevented us from appreciating it on the way up. 15:20: Again paddling through the Serrano River. 17:00: We will settle our camp in a beautiful and safety place. You will have a couple of hours to walk and explore the area. 19:00: A good dinner and rest will renovate our strengths and allow us to keep enjoying this adventure through the Patagonia. 7:30: A complete breakfast will give us energies to paddle. 9:00: Ready for the navigation. 13:00: Arrival at the mouth of the Azul River. Here we take a break to enjoy our box lunch. 14:00: We start to paddle upstream along the Azul river. 16:00: We arrive at the end of the Azul lake and enjoy a unique place. 18:00: We camp at the mouth of the Azul river. 8:00: We begin the return to Puerto Toro through the fjord. 11:30: We arrive to Puerto Toro where we prepare our things for our boat trip. 13:00: We begin our return to Puerto Natales through the Ultima Esperanza fjord on a large boat. 14:30: Lunch at the Estancia Perales. 17:40: Arrival in Puerto Natales. If you have left any luggage with us we'll go to our office to pick it up. This trip can run as a group trip, with prices starting from $767 per person for a complete group. If you are looking to join a group or you are a solo traveller we will help to form likeminded groups of travellers. Please let us know your travel plans. Price of USD $870 per person is based on a group of 2 people.